← Long live the obit! During the Kennedy presidency, television news became more powerful than ever. In the years since the quiz show scandals of the 1950s, television executives had been atoning by lavishing resources on their news divisions. Television sets were in the vast majority of homes by 1960, and the audience for the TV networks dwarfed that of any newspaper and even the readership of the entire Time-Life empire. The media president, Jack Kennedy, also introduced live television coverage of presidential news conferences and proceeded to thrive in the new forum. Television carried more news than ever, to more people. On November 22, 1963, television was the medium by which many Americans first got the news about the shooting. There it was, right on TV. The president and his wife were in a motorcade with Governor John Connally and his wife. Shots rang out, and the president was rushed to the hospital. No word on the shooter’s identity. It may not have been apparent to viewers, but television executives were scrambling to keep up. The networks did not have the equipment and staff needed to “go live” and put news on the air as it was unfolding. Just off camera it was pandemonium, as executives met to decide how to cover a presidential shooting in the new medium. Eventually they reached a consensus: they would stay with the story, without interruptions and without ads, for the duration. So it was that for three or four days the American people did something they had never done before: they stayed home and attended a funeral via television. 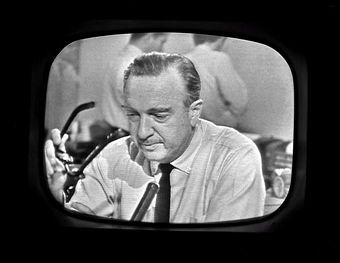 If they were watching CBS, they saw Walter Cronkite dab at his eye when he announced the bulletin confirming Kennedy’s death. No matter what network they watched, viewers saw Jack Ruby shoot Lee Harvey Oswald; they saw the flag-draped caisson and the riderless horse; and they saw the salute given by the president’s young son. For the first time (and almost the last, as it happened), nearly the entire country had nearly the same experience at the same time. John F. Kennedy live on the air on November 22, 1963.